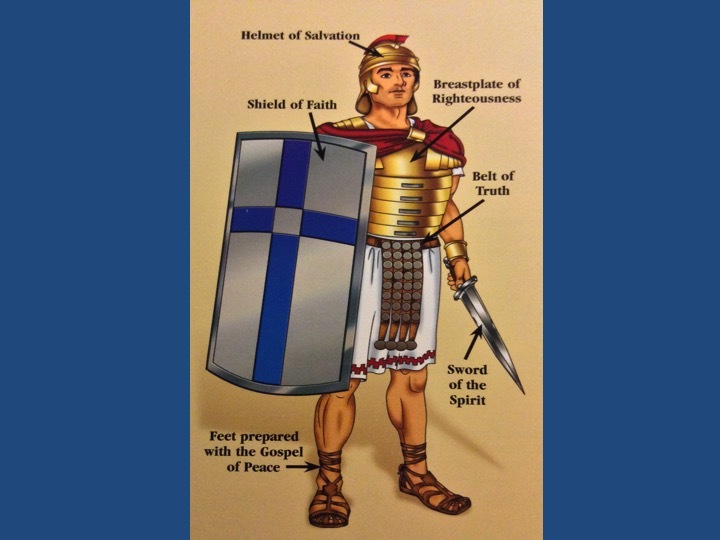 A familiar picture, even for children, of a Roman soldier in armor. 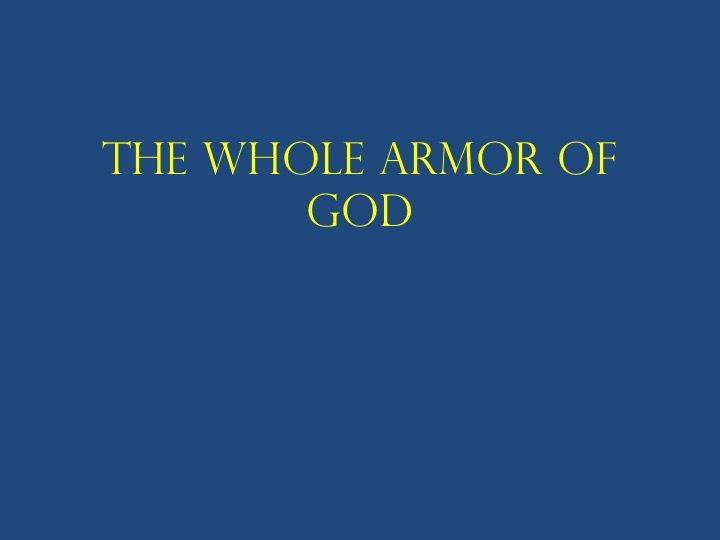 As believers, are we wearing the whole armor of God …right now? 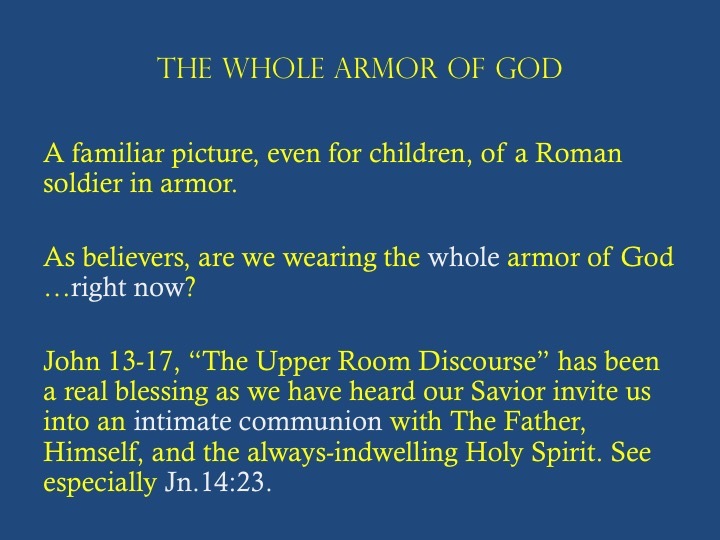 John 13-17, “The Upper Room Discourse” has been a real blessing as we have heard our Savior invite us into an intimate communion with The Father, Himself, and the always-indwelling Holy Spirit. See especially Jn.14:23. Study. It’s been so precious as I leave for my daily activities with joy having “My Heart-Christ’s Home”. 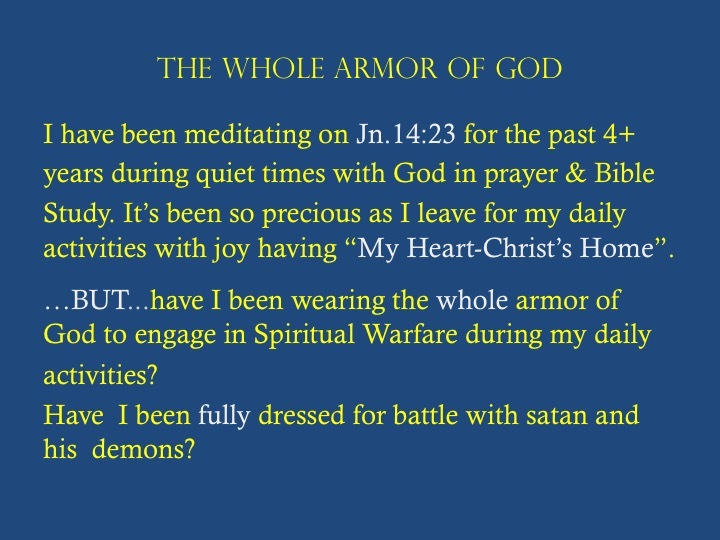 Have I been fully dressed for battle with satan and his demons? 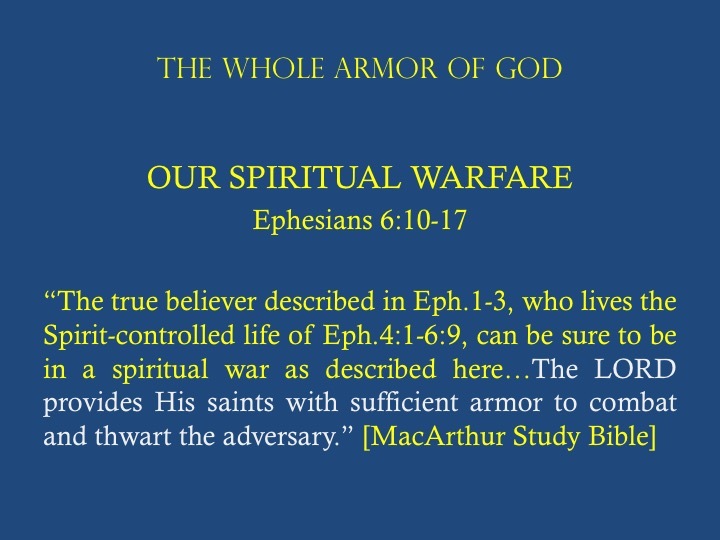 Spiritual Warfare was real in the garden-the Fall of Adam; for Job, Moses, Daniel, JESUS, Paul, etc. 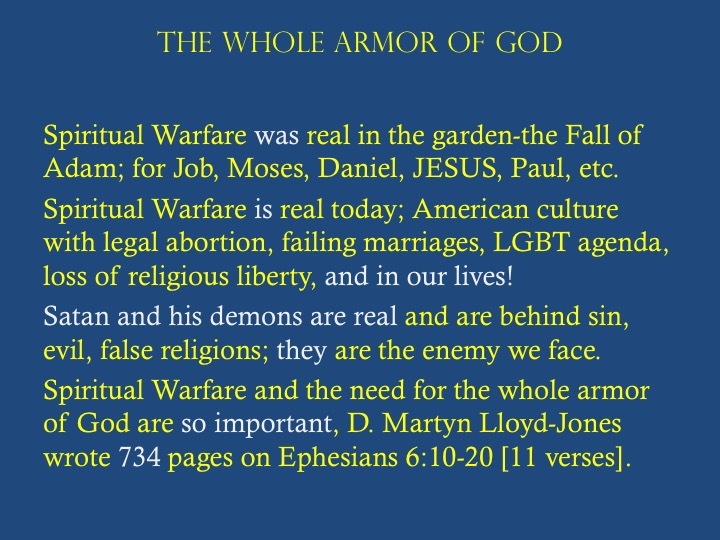 Spiritual Warfare is real today; American culture with legal abortion, failing marriages, LGBT agenda, loss of religious liberty, and in our lives! Satan and his demons are real and are behind sin, evil, false religions; they are the enemy we face. 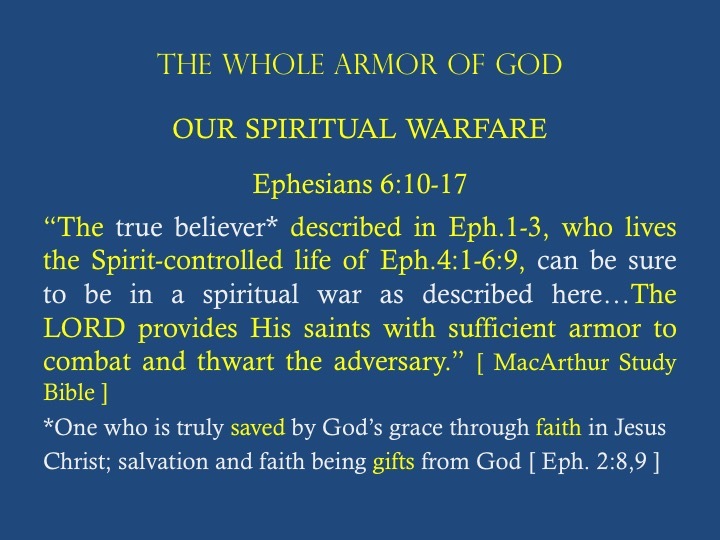 Spiritual Warfare and the need for the whole armor of God are so important, D. Martyn Lloyd-Jones wrote 734 pages on Ephesians 6:10-20 [11 verses]. 10 Finally, be strong in the Lord and in the strength of his might. 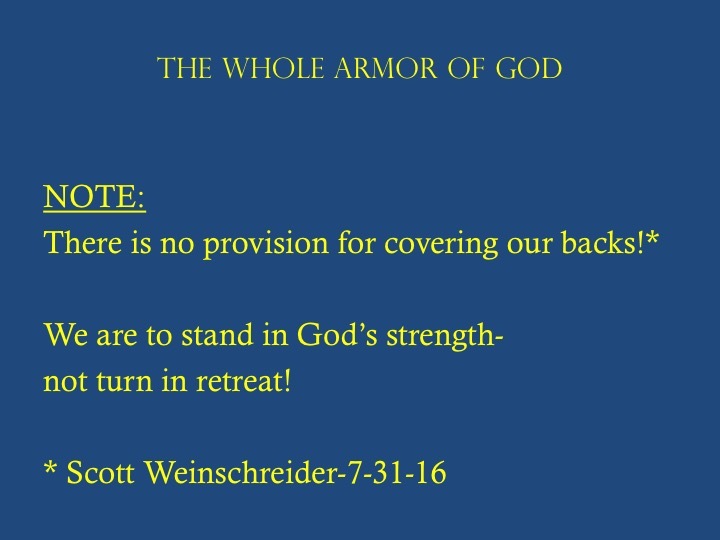 11 Put on the whole armor of God, that you may be able to stand against the schemes of the devil. 12 For we do not wrestle against flesh and blood, but against the rulers, against the authorities, against the cosmic powers over this present darkness, against the spiritual forces of evil in the heavenly places. 13 Therefore take up the whole armor of God, that you may be able to withstand in the evil day, and having done all, to stand firm. 14 Stand therefore, having fastened on the belt of truth, and having put on the breastplate of righteousness, 15 and, as shoes for your feet, having put on the readiness given by the gospel of peace. 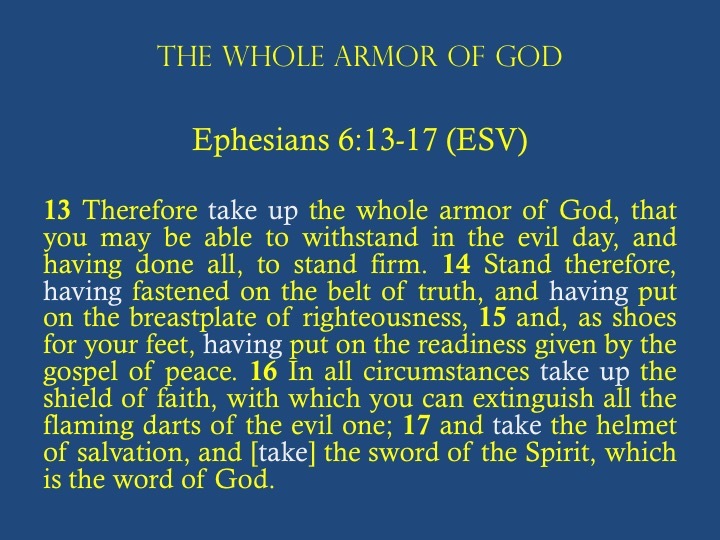 16 In all circumstances take up the shield of faith, with which you can extinguish all the flaming darts of the evil one; 17 and take the helmet of salvation, and the sword of the Spirit, which is the word of God. 10 Finally, be strong in the Lord and in the strength of his might. 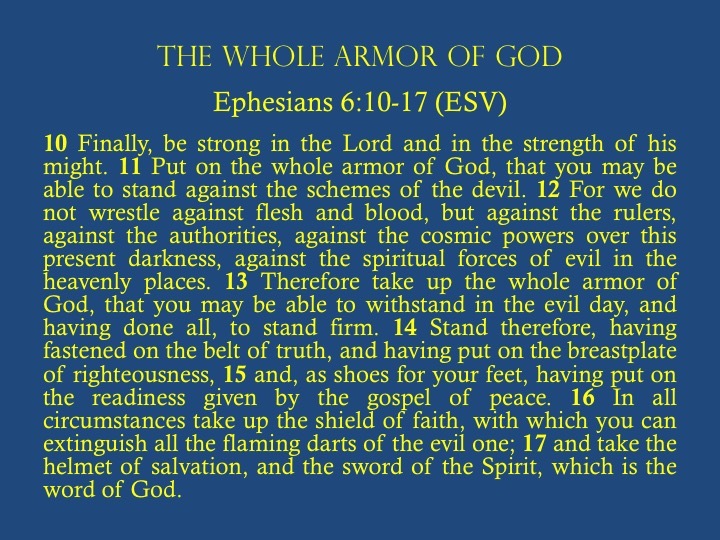 11 Put on the whole armor of God, that you may be able to stand against the schemes of the devil. 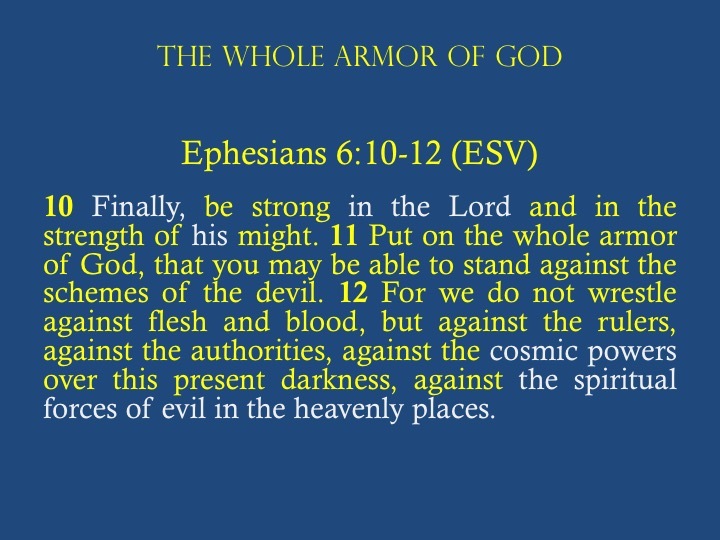 12 For we do not wrestle against flesh and blood, but against the rulers, against the authorities, against the cosmic powers over this present darkness, against the spiritual forces of evil in the heavenly places. 13 Therefore take up the whole armor of God, that you may be able to withstand in the evil day, and having done all, to stand firm. 14 Stand therefore, having fastened on the belt of truth, and having put on the breastplate of righteousness, 15 and, as shoes for your feet, having put on the readiness given by the gospel of peace. 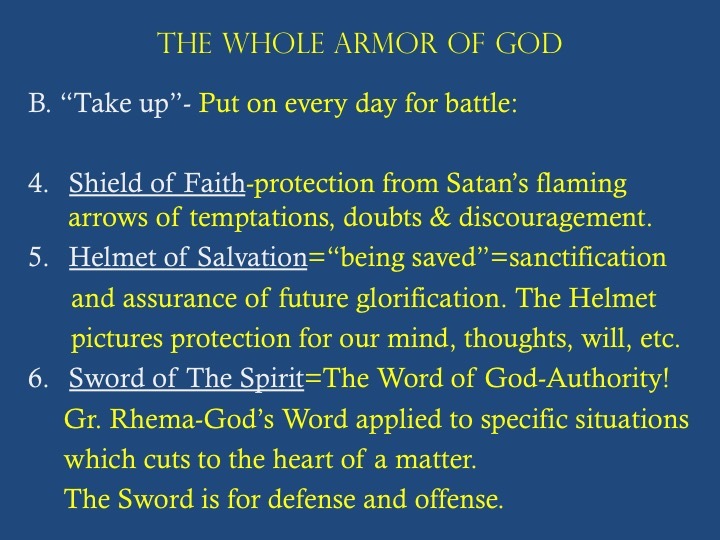 16 In all circumstances take up the shield of faith, with which you can extinguish all the flaming darts of the evil one; 17 and take the helmet of salvation, and [take] the sword of the Spirit, which is the word of God. 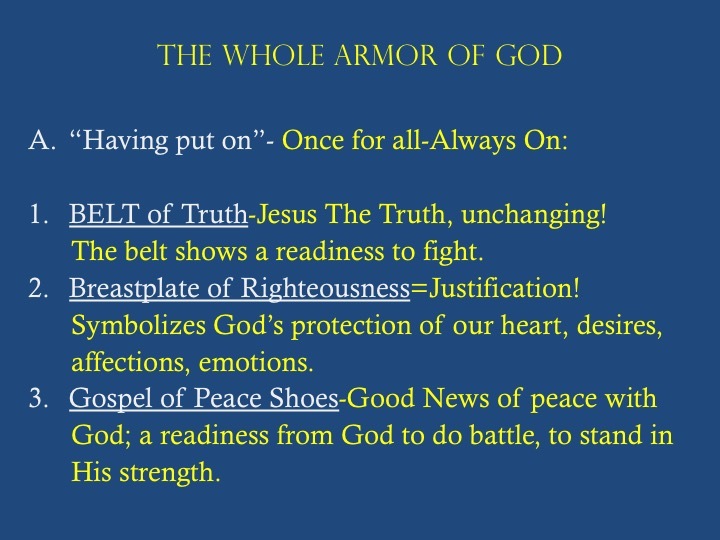 1.BELT of Truth-Jesus The Truth, unchanging! The belt shows a readiness to fight. 4.Shield of Faith-protection from Satan’s flaming arrows of temptations, doubts & discouragement. pictures protection for our mind, thoughts, will, etc. 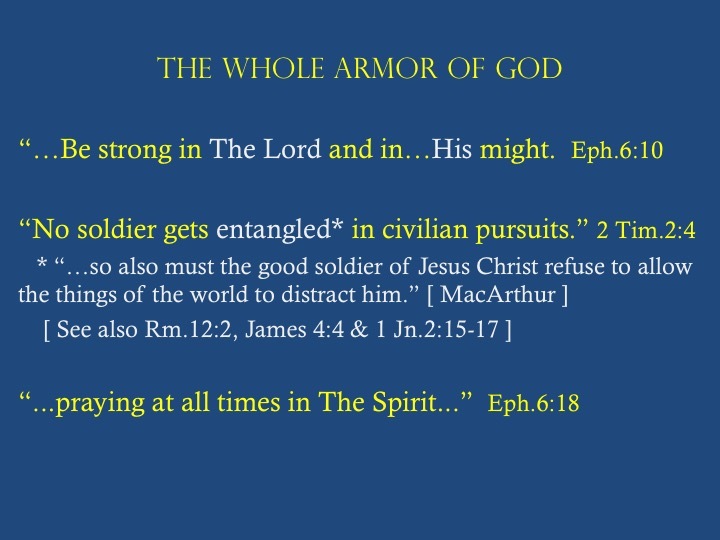 6.Sword of The Spirit=The Word of God-Authority! which cuts to the heart of a matter. The Sword is for defense and offense. 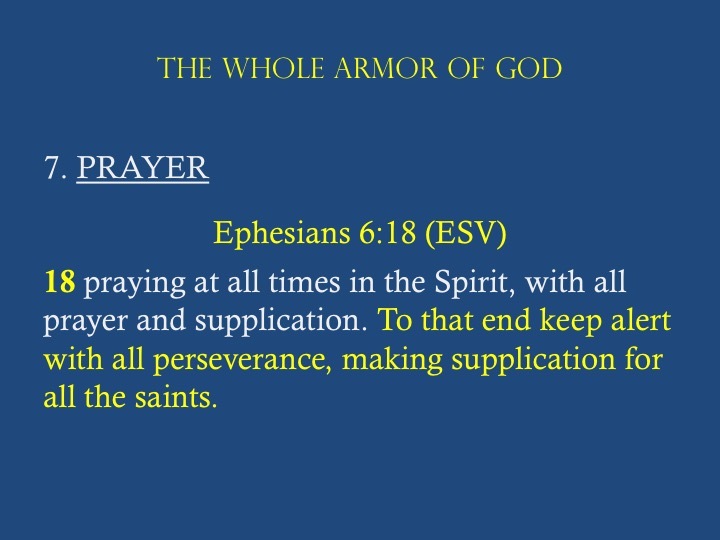 18 praying at all times in the Spirit, with all prayer and supplication. To that end keep alert with all perseverance, making supplication for all the saints.